No life without light. Lights inside a tent. When picking a grow tent, one of the important features to look carefully at, is the high quality fabric shell, that won’t tear. You’ll know whether or not fabric is high quality by checking the denier rating on the manufacturer’s specs. What’s a denier? It’s a unit of measurement that lets you know the thickness of the fibers that make up the fabric. The higher the number, the thicker the fabric. Thicker fabric translates to a sturdy, light saving shell. Experts suggest choosing fabric within the 600D to 900D range. Most, if not all, grow tents are equipped with a reflective interior. This is an important feature. 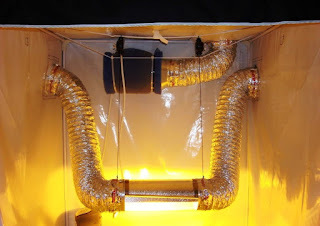 Not only does the exterior side of the fabric keep light from leaking out of the grow tent, the light that remains inside is amplified and reflected back to the plants. This encourages low-leaf growth. Areas of your crop that might not otherwise receive overhead light now have a way to gain light. 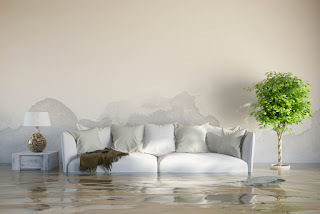 Flood Protection - Before the "Oops!" This doesn't need to be the case. One of the benefits of grow rooms is how they partition off your grow area from the rest of your living space. This is especially helpful if you live in a small apartment or if you want your basement to appear tidy. Pretty much all indoor grow tents have six sides: four walls, a ceiling and floor. If water or nutrient fluid spills the liquid falls onto the floor of the tent and not your personal floor. High quality grow tents offer a flood panel along with a floor. This panel is absorbent and provides a sturdy base for your grow tent. Not always a standard feature, especially in some bare bones packages, be on the lookout for this option. It can save you some serious damage to your rental unit or your home. A well-ventilated grow tent is key to healthy crops. Air flow encourages growth and discourages disease and pests. Grow tents feature ventilation ducts but when choosing a grow tent determine if the ducts are placed in areas that work for you. Also look for power cord outlets, not just ducts on the sides or upper levels. To prevent light leakage, check for velcro fasteners, cinches or other ways to tighten the duct so that minimal light escapes. One nice extra for this kind of set-up are observation windows. They allow you to maintain a hands-off approach without interrupting a carefully balanced ecosystem. You can still check in on your crop but you won’t disturb them. Observation windows are an added feature on most grow tents, just remember to zip or velcro the panel back into place to maintain a light seal. One other extra that many growers look for in a grow tent are pockets. Some grow tents have pockets that allow you to store equipment and other items in the tent itself. This leads to less clutter outside the tent and is an easy way to remember where all your gear is located. In some ways, grow tents are perfect for people who like yields but not gardening. Once you get the grow tent set up, the equipment situated and the plants growing all you have to do is automate the system. Lights come on and turn off. Hydroponic systems feed the plants at timed intervals. Ventilation systems cool and monitor air flow. You get to leave the house.